It’s common to have a lot of questions when it comes to foundation repair. This is a major, and important process for the safety, health, and value of your home. After the when, why, and how are answered, some more detailed and personally pertinent questions may come to mind. For homeowners that have a pier and beam foundation, one thing you may be curious about is how many piers need to be used to repair your foundation. Obviously the more piers that are used, the higher the cost of the repair will be. The answer to this question depends on a number of things. Of course affordability is an important concern, and in many cases your foundation repair company can work with you on this. This is really the only reason to do a repair in sections. As an example if your repair calls for 10 piers, but doing 5 is more financially feasible, the repair can be done over time. However, requesting that needed piers be removed from an estimate or repair strictly to save money on a house that is either being sold, or flipped is a problem. Occasionally investors or home sellers will attempt this to save money and time. However, this puts the new homeowner in a bad position. They are buying a home with a partially repaired foundation, and a warranty that doesn’t cover the unrepaired areas. If you are considering buying a home that needs foundation repair, or has had the foundation repaired, do your due diligence and confirm that a complete repair was done. It is also a good idea to get a second opinion. For over 30 years WCK Foundation Repair has been repairing and restoring the foundations of homes across south Louisiana. When you find evidence that you may have foundation damage, you know it’s time to call in a professional. But, before you have just anyone come out to your home, you should have an idea of what they will do once they get there if repairs are needed. Here at WCK Foundation Repair, we use the drilled pier method to repair your home’s foundation. However, others may offer a different method. You shouldn’t agree to let someone work on your home without knowing the dangers of using the wrong foundation repair method in Baton Rouge. There are essentially three other popular methods of foundation repair that are often offered. Each of these methods will be presented to you explaining their benefits, or more likely, how they will be utilized. But, each has a down side that all too often gets overlooked. The reason they have a down side is that in Louisiana, we have a unique soil make up that isn’t fully addressed by them. While very popular throughout many parts of the country, pressed pilings overlook the instability that comes with Louisiana soil. Put simply, pressed pilings are a stack of concrete pilings that stretch from your slab down through the active soil until they reach more stable earth underneath. Pressed pilings provide the depth you need, but not the width. If the active soil shifts, there is nothing holding them stable and upright, which can lead to movement or even collapsing as the soil expands and contracts. This movement can lead to further foundation damage. There is also the possibility of porous concrete pilings absorbing moisture and deteriorating themselves. Mudjacking involves pumping a cement grout (or in some cases foam) into a small hole or several small holes drilled near the crack in the foundation. This only fills in current gaps without truly solving the problem that led to your foundation in the first place. It will basically make the problem of your current foundation crack temporarily go away without addressing the root cause of what made your foundation crack to begin with. The problem with the spread footing method is that it doesn’t go deep enough to get beneath the active soil. The spread footing method, like mudjacking, will appear to make the problem disappear, but since it only goes two to three feet into the ground, it lacks the depth to be considered a permanent solution. Like pressed pilings, this could get the job done in an area of the country where soil is denser or doesn’t move as much as ours does, but here, it shouldn’t be trusted long term. We use the drilled pier method for repairing your home’s foundation. Where mudjacking or spread footing doesn’t go deep enough below the surface of the ground, the drilled pier method goes up to eleven feet deep, or until a change in the soil is found. What the pressed piers lack in stability, our drilled pier method utilizes rebar reinforced piers. This sturdies the concrete to alleviate the potential for shifting or collapsing. With over thirty years of experience dealing exclusively with Louisiana soil, we have found this to be the most effective method to fix your home’s foundation for the long term. If you have any questions about the drilled pier method, or want to ask about the pros and cons of other methods, feel free to give us a call at WCK Foundation Repair. Many homes in South Louisiana are raised off the ground as a way to avoid flooding. Some of these homes have bricks underneath them, some have wooden beams, and some have cinder blocks or concrete blocks. These homes are built on what is called a pier and beam foundation. The cinder blocks you see go into the ground and connect on top with the system of beams that supports your house. The good news about these homes is, they provide a number of benefits that a slab foundation doesn’t. Since they are separated from the ground, it is harder for termites to infiltrate the home. Also, the separation allows for air to pass under the house which allows the soil to dry and not retain excessive moisture for extended periods of time. The bad news is, pier and beam homes are just as susceptible to foundation problems as a home that is built on a slab. Spotting problems with a cinder block foundation is very similar to spotting problems with any other pier and beam home. Even though your home is elevated, and air can flow freely underneath it, the changes in moisture level in the soil can allow for that soil to shift or move. If that happens, you may start to see signs of the damage inside your home. While these symptoms don’t guarantee you have a foundation problem, they do mean you should have them addressed immediately. Neglecting them could easily lead to them worsening.WCK has been working with foundations in South Louisiana for over 30 years and we specialize in pier and beam foundation repair. In Baton Rouge and throughout South Louisiana, you don’t have to look far to find homes that are raised off the ground. Some of these are newer construction, but for the most part, they are older homes. They provide southern charm and relief from flooding, but they also present possible challenges for the homeowner when it comes to foundation repair. The reason most older homes are raised is because before concrete slabs became popular, the pier and beam foundation was the foundation of choice. As mentioned, they do provide relief from flooding. Before sewer and drainage systems were modernized, rain water stayed where it was for a longer period of time. This meant that homes needed to be above danger while still being sturdy, hence the need for the pier and beam method. Also as mentioned, these homes present challenges when it comes to those foundations. Since your home is not on a slab, the beams that support your home are more susceptible to shifts in the soil underneath the house. This is especially a problem if drainage around the beams is slow. The wetter the soil, the more likely it is to move. So, we would like to offer a few things to look for when troubleshooting foundation problems for raised homes in Baton Rouge. The first of these is cracks in your walls. Just like you would find if your home was on a slab, when you have foundation problems, you will see the evidence in cracks in your walls. As beams move, it can cause strain on the walls that leads to these cracks. Another thing to look for is uneven doorframes and window sills. If your foundation has shifted, you may notice that door don’t close all the way, or swing back open. You may also find that windows don’t open or close as easily as they should, or don’t open at all. This is usually because the sill and frame of the window are no longer aligned with the window itself. One problem that you will find with raised homes that you won’t find with a slab is sagging floors. Since there is no consistent slab underneath the entire home, a shift in beams can lead to a dip or a lean in the floor. Outside the home, one thing you can look for to troubleshoot possible foundation damage is mold or mildew around the beams themselves. If you see this, it means that water is hanging around too long, leaving you at risk for the soil to loosen and allowing the beams to move. If you notice any of these problems, you want them addressed immediately. The longer these issues are allowed to linger, the worse they get. Having worked in Baton Rouge for over 30 years, WCK knows the ground in south Louisiana. With that knowledge, we have been able to specialize in pier and beam foundation repair. Pier and beam foundations are the original foundation systems for residential dwellings. They have largely been replaced by concrete slabs, but they can still be just as effective as their concrete counterparts. Of course each foundation system has its own advantages, for example, pier and beam foundations feature an integrated crawl space by design. However, when it comes to repair they also have their differences. Here are a few things to know when it comes to discovering pier and beam foundation damage as well how to prevent it. Again these are only a handful of signs of pier and beam foundation damage, but they can tell you a lot about what type of work needs to be done. Soil, especially in south Louisiana, is the main underlying (pun intended) cause of foundation damage for both pier and beam and concrete slab foundations. The soil in our area is a very clay-laden soil and retains moisture and expands when it’s wet, and as it dries it retracts. Either of these scenarios can cause problems by moving the piers that support the beams and the rest of the structure. A combination or “pulsing” of the soil can also create problems. Controlling drainage is a key way to prevent foundation damage and sustain the results after a repair. Being able to maintain the moisture in the soil under and around your home is essential to the health of your foundation. Anywhere you see pooling or ponding water is a sign of poor drainage. Having clean and clear gutters and downspouts are a must. These will carry water away from your home. If there are still trouble spots near your home, it may be time to take some extra measures to control drainage, like: swales, French drains or trenches. If you believe you have damage to your pier and beam foundation, it is important to trust your home to a knowledgeable, experienced, local foundation company. Not only does our part of the state have unique soil, but pier and beam work requires different methods and skills than work on slab foundations. For over 30 years WCK Foundation Repair has been using the only proven methodto repair concrete foundations. WCK is also specialized in pier and beam foundation repair and offers a 6 year limited warranty on repairs. Depending on the kind of car you drive you’ll experience different maintenance needs from other vehicles. Depending on how you drive and what you use it for will create other variables that influence how your car or truck ages and performs. A truck that is used for hunting may need more alignments than a car that is only driven on highways. The type tires you buy are also going to vary in size and price. But, whether it’s a car or a truck, in the country or in the city, you have to maintain the tires and the engine. The same is true for your home. While there may be fewer variations, they can all experience the same problems. However depending on the type of foundation your house is built upon, the signs of damage and mode of repair can vary. Most homes built today have a concrete slab foundation, but many older homes may have a pier and beam foundation. Pier and beam foundations were the popular method for supporting homes in the 1950’s and 1960’s. A home with a pier and beam foundation has wooden floors and a substructure (or beams) that are supported underneath by concrete piers. These foundations as they can be unique to older homes in Hammond and across Tangipahoa also have unique signs of damage and require unique repair methods. Failing pier and beam foundations are typically caused by soil beneath the foundation. The soil in south Louisiana is an expansive soil. As the soil gets wet, it expands; and as it dries it contracts. The constant pulsing that is a consequence of our weather patterns can cause the piers to shift. This moving soil can also cause voids beneath the foundation causing the piers to sink. If you have noticed any of these signs it is time to consult a trusted, local and knowledgeable foundation repair company. WCK Foundation Repair is the expert at repairing and restoring pier and beam foundations. Their skilled team understands the natural forces that impact our part of the state and structural details of these homes. For more information, click here. Pier and beam, or post and beam, foundations offer one of the more distinct architectural styles to our part of the state. Much of the character, charm and local flair that homes built in the late 1950’s and 1960’s provide can be identified by this type of foundation, which was popular at the time before builders began to opt for concrete slab foundations. Pier and beam foundations were considered advantageous for areas with expansive soil, much like the soil found in and around Mandeville, Louisiana. The soil in south Louisiana is unique and even distinct from other areas of our state. The nature and geography of southern Louisiana means that even within a short distance, like from the North Shore to New Orleans, two widely varying soil types can exist. Homes and businesses built along the I-12 corridor all sit on a clay-laden, expansive soil. In contrast, structures on the other side of Lake Pontchartrain have soil that is much closer to the water table. These foundations require a specialized method, called pressured pile, where pilings are driven over 70 feet into the ground. This is the only effective practice here, but is highly ineffective in the denser soil of Mandeville. Now that we’ve addressed the soil differences, how can you tell if you have a pier and beam home? A pier and beam foundation is a type of substructure that is elevated and typically has a crawl space of about 18” underneath it. This type of foundation does not rest directly on the ground. The floors of your home rest directly on the floor joists. What kinds of problems can you have with a pier and beam foundation? Decay or damage to wooden beams and joists: Could be caused by excess moisture or pests. Movement of interior piers: Another example excess moisture that is cause the piers and/or soil to move. If you have noticed any of these common signs of foundation damage, it is time consult a local, trusted foundation repair company. WCK Foundation Repair has been helping homeowners across South Louisiana for over 30 years. WCK specializes in pier and beam foundation repair and understands the different elements that impact our homes and businesses. For more information, click here. Every activity, objective and action has its ideal method. It’s hard to hit a golf ball 300 yards with a sand wedge, just as it’s hard to hit a ball out of a steep sand trap with a 3-wood. There are specific tools and methods to overcome each of these challenges. The same principle of using the right method for a job is vitally important to foundation repair. While there are likely a few options to get the job “done”, there is really one best option. If you had to cut your hair you could go see a stylist or you could take a pair of scissors to it, either way your hair gets cut, but isn’t one option better? For your home on the north shore in Slidell, it sits on a unique, expansive, clay-laden soil that requires a specialized method and expertise. However, very few companies recognize the challenges that this soil presents to foundations. Many companies in our part of the state are actually based elsewhere across the country. These foundation repair companies and their crews use methods and tools that are designed to repair foundations built rocky soil. Simply put, this doesn’t work on our clay soil. The forces of nature in south Louisiana demand a specific solution, otherwise you could be paying for a repair that doesn’t actually fix any problems. So what is the best method? The drilled pier method is the perfect remedy for the damage caused by our expansive soil. Whether you have a pier and beam foundation or a concrete slab, installing piers that stabilize the foundation completely actually prevent any further or future damage. WCK Foundation Repair has been using the drilled pier method exclusively for over 30 years. With a fully transferrable lifetime warranty, the quality and effectiveness of this method and craftsmanship speaks for itself. For more information, click here. One of the many unique things that the landscape of Louisiana offers is a wide variety of architecture and home types. Whether it's brick or stucco walls, shingled or tiled roofs or oak trees or cypress trees in the front yard, they are all a little different. Home foundations are no different. One thing that Louisiana homes have as part these unique styles is the pier and beam foundation. While many homes have a traditional concrete slab supporting the structure, many others have a pier and beam, or post and beam foundation. This was the common foundation design until the 1950’s. This foundation type is identifiable by its elevated structure and crawl space. While this foundation has its benefits and charm, it also can also have its problems. If your home is built on a pier and beam foundation you may notice a range of issues spanning from sagging floors and squeaking to cracks in the wall. Here is a list of 3 common problems that lead to pier and beam foundation damage. 1.) Movement of interior piers: The support for the interior beams is typically wood and concrete. When water is able to get into the foundation, it can cause these supports to move. 3.) Movement of exterior piers: These piers can often sink or move due to the soft ground. Again controlling moisture and drainage is essential in preventing this type of movement. 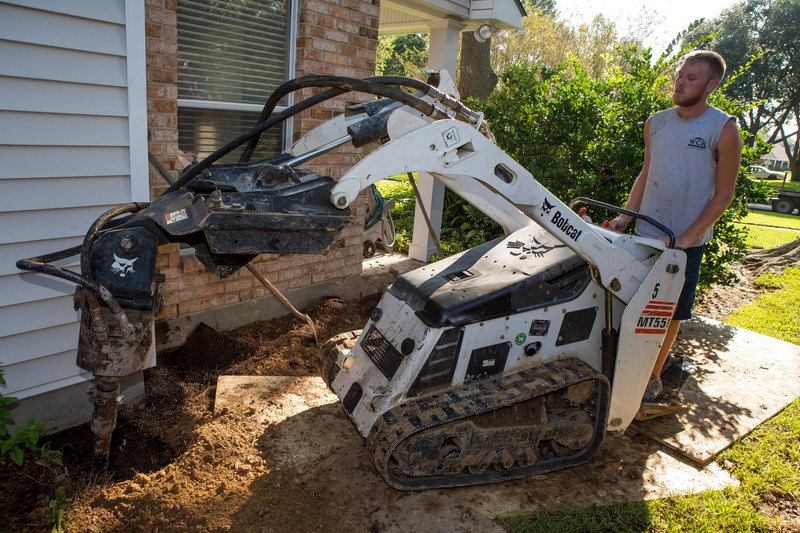 These foundations can present unique problems, largely due to the unique soil that homes in our part of south Louisiana are built upon. The clay-laden, expansive soil presents different threats and challenges. It is important that if you suspect any of these problems or notice any of the common signs of foundation damage that you trust a local expert that knows about both, the forces of nature in are our area and the design of the pier and beam foundation. For over 30 years, WCK Foundation Repair has been helping homeowners restore the value and safety of their homes. Whether you have a concrete slab that needs repair or a pier and beam foundation with issues, WCK’s proven method and team of local experts are ready to help. For more information, click here.